Truth About Daisies will be playing in the UFF tasting room. Come check out the amazing Kombucha, cider, beer, jun and mead, all made from seasonally available ingredients—24 taps that change daily. Come hang out with Truth About Daisies at this cool local venue! Enjoy beautiful York and a Truth About Daisies concert by the sea. Bring a picnic dinner and a blanket! Truth About Daisies is back at Lenny’s for a Spring show. Bring your friends and an appetite and enjoy a fun night out! Looking for something to do in Portland on Valentine’s day? Come on out to One Longfellow Square and hear songs of love, passion, heartbreak— relationship songs of all types. Let Truth About Daisies take you on a musical and relational journey. Valentines decor, treats, and activities—have a fun night with the band and each other. Special guests Liam Swift, Carolyn Currie, and Ronda Dale. 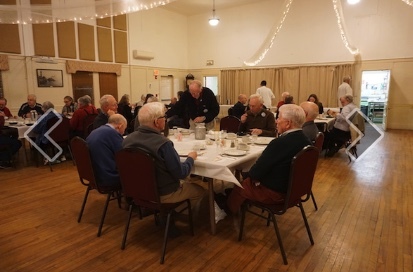 Truth About Daisies will be entertaining club members from 7 to 7:30 after the weekly Friday night dinner at the Woodfords Club. You can come just for the music at 7 pm or email us if you want to attend the delicious 6 pm dinner and be our guests. Come check out the newly remodeled lobby at the club and hang with Truth About Daisies! Saturday night fun at Lenny's—with special guest Liam Swift opening at 7 pm. This talented 17 year old singer songwriter will perform a 1/2 hour set to start out the night. Come on down to the historic Hawke's Plaza--bring your friends and an appetite for Lenny's delicious food and drinks. Enjoy a cozy fall evening with Truth About Daisies. Grab some kettle corn, a turkey leg, and some fried dough and come join us at the amazing Fryeburg Fair for 3 sets at the Hayseed Theater, Saturday, October 6th, at 5, 6, & 7pm. Come celebrate the first day of Autumn at the Woodfords Corner "Cornerfest" 5-8pm block party located at the Woodfords Congregational church / Portland Conservatory of Music parking lot on Friday, Sept 21st. Truth About Daisies playing at 6pm, with various other musicians, theater performances, arts & crafts, and neighborhood vendors sprinkled throughout the venue. Food and drink aplenty, along with good cheer and possibly some neighbors you've never met before. Come wander aimlessly amongst the many musical porches of Deering Center, on the west side of Stevens Ave, and catch Truth About Daisies at 1 pm at 43 Richardson St. You can find more info on Porchfest if you google 'Deering Center Porchfest' for the schedule. This is a 'do not miss' event! Also a good one to bring a bike if you want to make the rounds more efficiently. Join the fun! Truth About Daisies recycles some of their best material for Portland's annual Greenfest--your chance to get caught up to new levels of environmental awareness. There could even be a rogue performance by Greenfest founder Jeff Edelstein, who enjoys playing keyboards almost as much as he enjoys saving our planet. Join us at Fort Allen Park overlooking beautiful Casco Bay for the Friends of the Eastern Promenade’s Annual Concert Series. Truth About Daisies will be playing in the gazebo. There will be food trucks, space to spread a blanket, and great summer vibes. Truth About Daisies plays a one hour concert in beautiful Naples. Come early and enjoy a swim in Long Lake then bring a picnic and a blanket to the show on the Village Green for an iconic Maine summer evening! Enjoy Truth About Daisies' tunes and a warm mid-summer Saturday night out at Lenny's. Bring your friends and an appetite as Lenny's serves up delicious food and drink. We hope to see you there! Come early for a dip in the ocean or a walk on the beach. Then bring a picnic dinner + blanket or chairs to the gazebo and enjoy some lovely Maine scenery and Truth About Daisies' tunes at the Ellis Park Concert Series. Hope to see you there! Come out and chow down some deep fried full-belly clams, grab some blueberry ice cream, and kick back for an hour of Truth About Daisies in front of the North Yarmouth Academy, under a big tent in the shade, 3 - 4 pm. Ahh, summer! Come on out for a night in downtown Portland with Truth About Daisies at The Dogfish. Enjoy an evening of music in this intimate atmosphere--and come hungry as Dogfish has an excellent dinner menu! Join us at Lenny's in the legendary Hawke's Plaza in Westbrook for a Saturday evening of music, great food, cold drinks served up by friendly staff, and good friends. In case you didn't know, Friends of Woodfords Corner is a collaboration of residents, businesses and organizations interested in the revitalization of the Woodfords Corner area in Portland. And this event is their Spring Social--open to the public! Come on out to celebrate this important project with friends, neighbors, and Truth About Daisies! Come out of hibernation for some savory music, catchy food, good friends, and a hot toddy or two with Truth About Daisies at Lenny’s, located at the walking service repairman sign on 302 in Westbrook. Come join us at Dogfish for great food, friends, cold drinks, and warm music! Come with an appetite to hear Truth About Daisies play at Lenny's restaurant and music venue in the historic Hawkes Plaza in Westbrook--hang with the Daisies and enjoy great food and drink! Playing the 2nd set @ 9pm after some Wed night bluegrass. (FYI—if you’re looking for Blue’s Wed night Irish music you’ll have to be content with Sheila’s Irish heritage ;-) Come out to Blue and get a dose of it all, along with intimate atmosphere, tasty food, and cool beverages. Truth About Daisies will be doing a 3 hour tour of the Fryeburg Fair. Yee ha! Portland Deering Center's own Porchfest - 3 hours of neighborhood bands playing on porches thoughout the neighborhood. Truth About Daisies will be playing at 11 Florence St, most likely at 1-2 pm. Free music, food trucks, & tons of environmental booths for clean, sustainable living! Come join the fray! Bring a blanket, grab a plate of fried clams, and come hear Truth About Daisies on the NYA stage at The Yarmouth Clam Festival!